That is the essence of the world. The Tathagata has no essence. The world is without essence. Crossed legs and part of the left hand completing a solemn Padmasana. Demolished above the waist in the violent conquest in the middle ages. Now worshiped as Yakshi at Nileeswaram Siva temple, Pattanam. Ernakulam dist, Kerala. 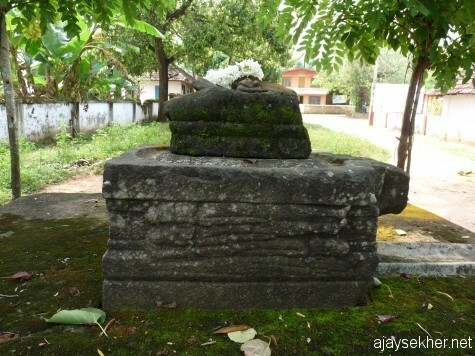 It was Prof P J Cherian the director of KCHR and the Pattanam/Muziris excavation project who drew my attention to certain broken granite sculptures kept in Pattanam Nileeswaram Siva temple a couple of months ago. A retired school master told him about the fragments, says Prof Cherian. 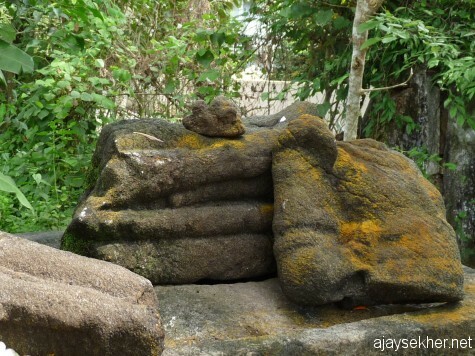 These fragments were recovered some 70 to 80 years ago from the temple pond and placed on the raised platform of the Yakshi outside the Nalambalam structure beneath a Pipal by the pond. The pedestal and half-undone Padmasana idol from the back. 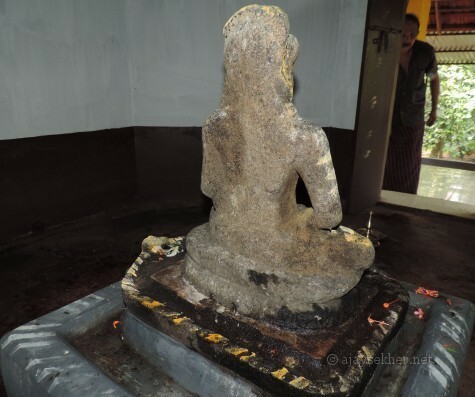 It was recovered from the temple pond almost a century ago and placed on the Yakshi platform by the pond under a Pipal tree. Mavelikara, Kayamkulam and Kattanam Buddhas were also recovered by the people from current Savarna temples at the same time. 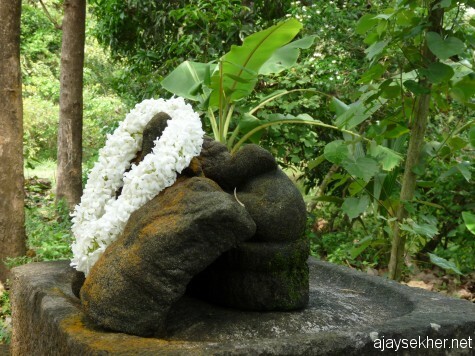 People still worship these broken idols as Naga Yakshi and Naga Raja. But in close examination they were found to be of different statues. A seated figure in Padmasana is the vital fragment. Yesterday, 26 Oct 2012 I got time to visit Pattanam and had a close and enlightening view of the fragments. It is placed on a pedestal with a water chute. The iconographic style, color of the stone, chiseling style and texture of the stone closely resemble the Buddha idols recovered from Mavelikara, Karumady, Bharanikavu and Kayamkulam in the south. Four fragments are placed together and that is why it was difficult for the people to decipher the mystery of Pattanam Buddha. It again is a hegemonic act of obscurantism and erasure of vital past by the obliterating Savarna Brahmanical forces who still specialize in burying their own past in a repressive and fascist way. 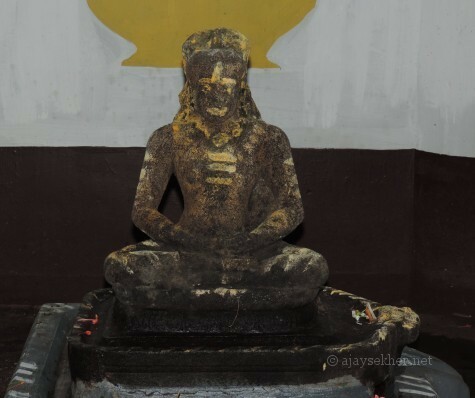 This idol in Padmasana seems to be demolished above the waist and is the only one resembling a Buddha idol reported to be recovered so far from Ernakulam district. The regions between Edapally and Vadanapally thrive in place names with the common affix Pally, a Pali word signifying a Chamana sacred place. All other Buddha idols recovered so far are from Alapuzha and Kollam districts. Plenty of similar Buddha sculptures are also reported from Tyaganur, Ariyalur, Nagapatinam and other parts of Tamil Nadu, especially in Madurai and Tirunelveli districts. 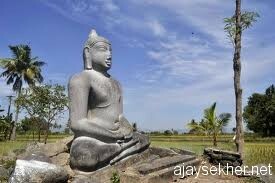 Tyaganur Buddha in the open field for the last one thousand years or more, from Tamil Nadu. 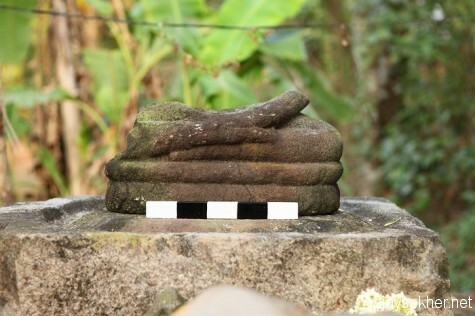 Any way it is very important to note that the idol fragments were recovered from the temple pond. It was the same in Mavelikara, Kayamkulam, Pallykal and Karumady. 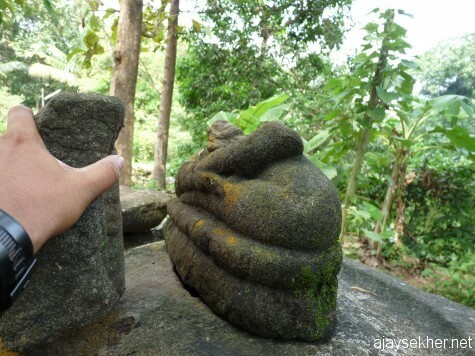 All the Buddha idols in Kerala were recovered from current Savarna temple ponds or paddy fields in their vicinity. 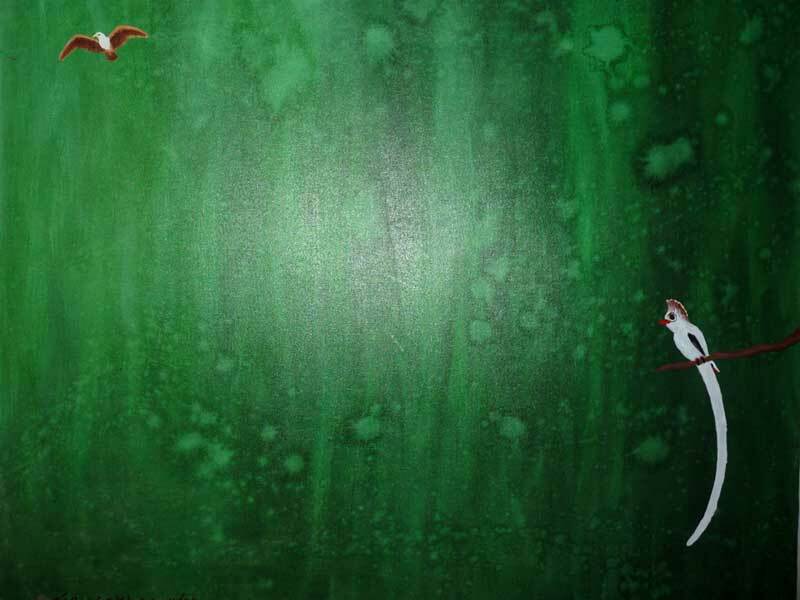 They were violently attacked uprooted and thrown or buried in ponds and marshes. The Buddha at Tyaganur is still sitting pretty in the open field exposed to the elements almost a millennium after its creation by skilled sculptors or Chamana sages themselves. Perfect disguise of the past: the fragmets placed together in an ambiguous way. 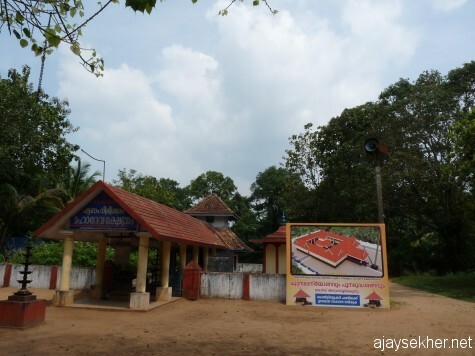 Nileeswaram temple at Pattanam is so close to Cherai the birth place of Sahodaran Ayyappan who initiated the neo buddhist movement in Kerala during the renaissance cultural revolutions in early 20th century. Sahodaran has written extensively on the destruction of buddhist shrines in Kerala by Brahmanic Hindutva forces like Kodungallur and Srimulavasam in particular. 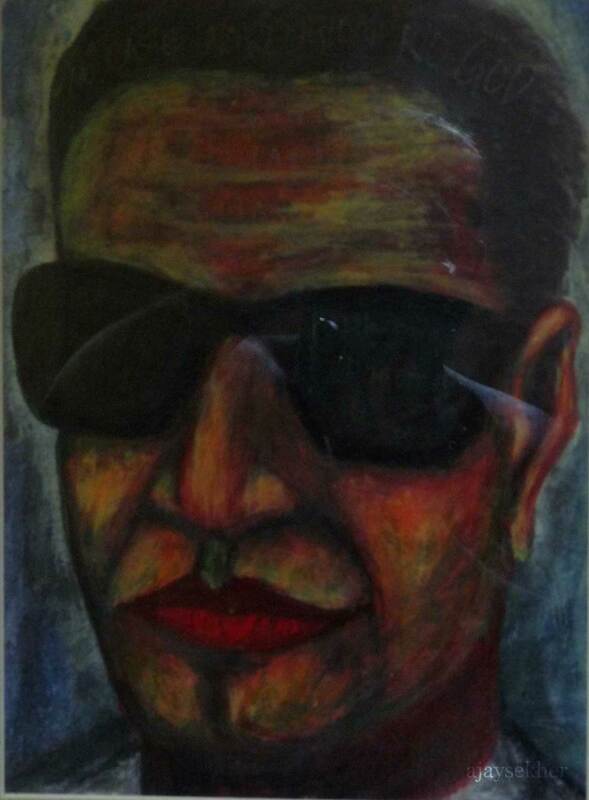 Remember his song “O don’t go to the Bharani O brothers…” Because of his scathing critique of Brahmanism and Savarna elitism, Sahodaran the greatest organic intellectual that Kerala has ever produced was systematically excluded from the high canon and textbooks by the Savarna literati, who instead celebrated Asan for his mild Hinduized worldview. It is not likely to be a Jain Thirthankara image because there is no Mudra or symbols of animals or Chaitya trees associated with each Thirthankara on the base or pedestal. Moreover the stylization of the figure and its seated posture and orientation of the limbs closely echo the Buddhas at Mavelikara, Karumady and Bharanikavu. 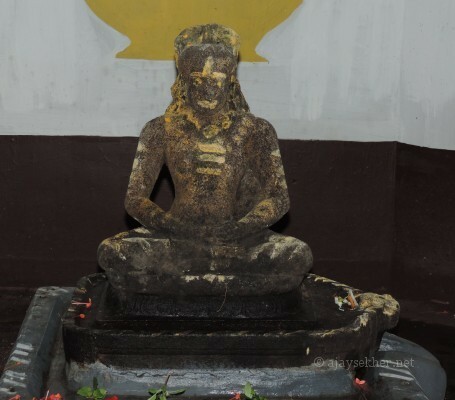 P C Alexander and S N Sadasivan who wrote the history of Buddhism in Kerala have argued that these south Kerala Buddhas resonate the Anuradhapura style of stone sculpting and chiseling. The blackness and density of the granite and the exquisite oily suppleness of appearance closely link the Pattanam fragment to its counter parts in Alapuzha and Kollam and in the far south in Srilanka. Mavelikara Buddha, recovered from the paddy field adjacent to Kandiyur temple and placed at the Buddha Junction, Mavelikara. Note the lotus posture/Padmasana with crossed legs and connected hands. See the tone and texture of the stone and its colour that is recurring in all the Buddha idols including the Pattanam Buddha recovered from Kerala. It is a mockery of history that these invaluable fragments of Pattanam went unnoticed and unidentified for the last one century. It shows the repressive power of the mainstream Savarna Hindu ideology and common sense that becomes hegemonic and annihilating. 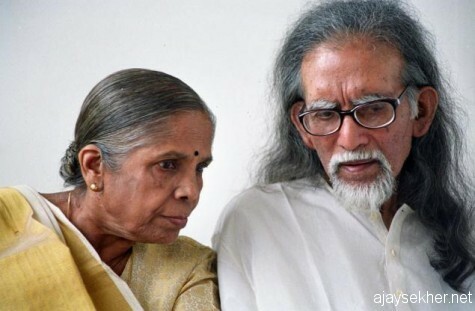 Crucial suppression and erasure of collective consciousness, memory, past and integrity under cultural hegemony is a key aspect of Kerala’s elite culture called Savarna supremacism. Genocidal and symbolic violence and perpetual erasures and mutilations are its chief tenets. These historic and epistemic violences are legitimized in the name of an omnipotent god and timeless religion. The pivotal significance of the archetypal phallus or the Linga in the Saivite Hindutva appraisal gains meaning in these contexts. 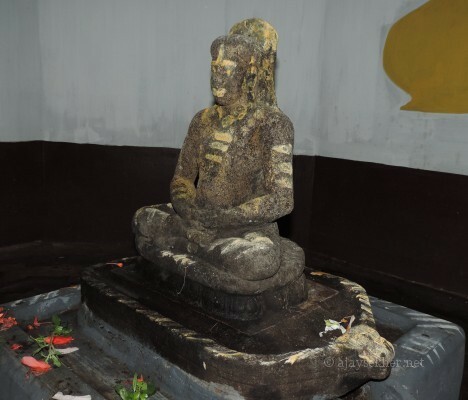 The broken figure in Padmasana at Pattanam is yet another key-marker of the cultural reality and history of Kerala. It proves once again that grave and material violence was used to convert and modify the ethical and egalitarian spiritual practices and instructive places in Kerala during the early middle ages by Brahmanic Hinduism and its strategic appropriating tropes like Saivism and Vaishnavism. 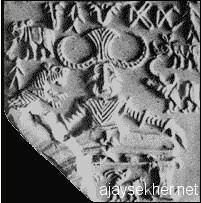 The Brahmanic henchmen belonging mostly to the Maravar and Kallar clans, literally demolished and buried all the traces of Buddhism and its non violent culture in Kerala with true Sudra allegiance and slave like fidelity to their caste- sovereigns, the earthly gods or Bhudeva. 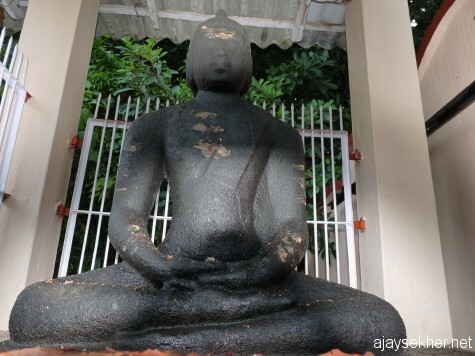 Buddha at Bharanikavu Pallykal, Katanam near Kayamkulam. It was also recovered from a pond behind the current Hindu temple in early 20th century. Till then it was used as a washing stone and foot cleaning stone in the temple pond. See the close similarity in chiseling style and lotus posture; with Mavelikara, Karumady and Pattanam idols. Pallykal Buddha is dated to 7th century by experts. Now protected by Archeological department of Kerala. 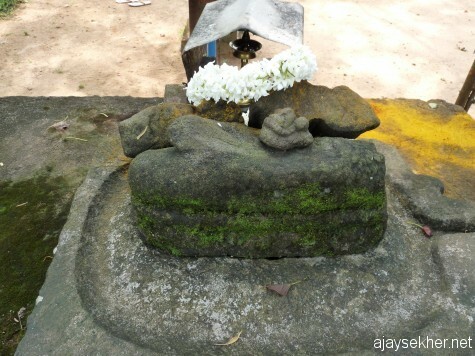 The pedestal with lying human figures piled on one another on which the Padmasana figure is placed at Pattanam Nileeswaram Siva temple. Ernakulam dist of Kerala. 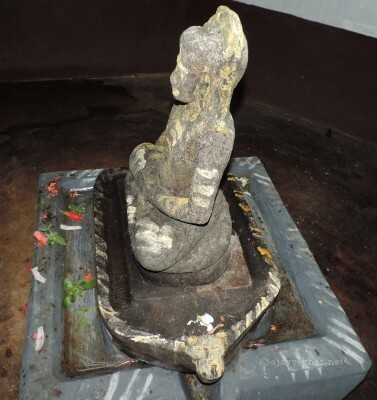 Note the easy chiseling possibility of modifying such idols and seats into a Siva Linga. It was practiced through out south India by Brahmanism and its assimilatory tropes like Saivism and Vaishnavism to convert Chamana Pallys. 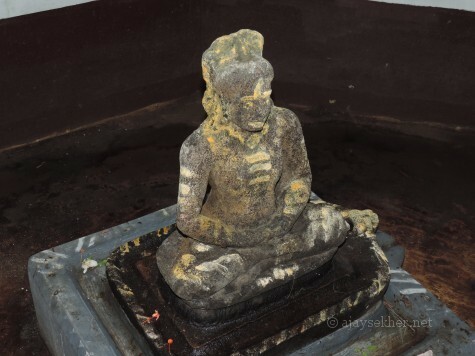 The broken granite Buddha sculpture at Pattanam testifies this fascist violence that is still brewing in the present against minor sects, others and out castes in India by the Hindutva and Savarna henchmen. Pattanam Buddha is a vital fragment of history that teaches us to be vigilant against cultural, iconographic, architectural and epistemic violence and alterations by the power elite done with coercion and appropriating strategies. 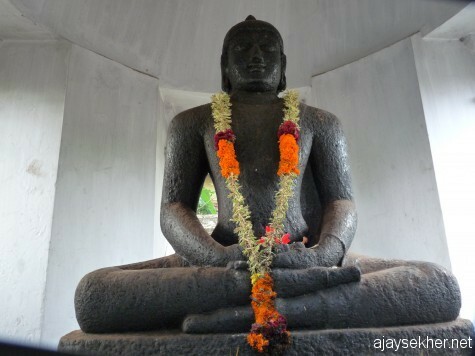 It is striking that Pattanam is so close to Cherai where Sahodaran Ayyappan initiated the most dynamic neo buddhist discourse in Kerala along with C V Kunhiraman and Mitavadi C Krishnan in the early 20th century as part of the cultural struggles now termed as Kerala renaissance under the visionary leadership of Narayana Guru who symbolically and radically subverted the Brahmanical hegemony through his Aruvipuram installation in 1888. 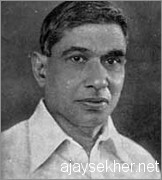 Sahodaran Ayyappan (1889-1968) wrote extensively on Buddhism in Kerala at the wake of the 20th century. His verses contain a special section “Baudha Kandam.” Instrumental in initiating neo buddhism in Kerala. Also initiated live dialogues with Ambedkarism and Periyor movement in early 20th century Kerala. In his verse and prose he reintroduced the ethical message of the enlightened one to the people in their mother tongue Malayalam as against the Pali of the Amana monks. Sahodaran journal was dedicated to the teaching of ethics to the dalitbahujan people in Kerala. He used the Pipal leaf as its logo and compared the modern boddhisatva of Kerala, Narayana Guru to the Buddha himself. The coinage “Sri Narayana-buddha” is an insightful and futuristic semantic construction by Sahodaran. He also inaugurated the rationalist and civil/human rights movement in Kerala in early 20th century that culminated in the Kerala model and modernity in a few decades. Nileeswaram Siva temple at Pattanam. Towards the right background the big Pipal stands and beneath it the Buddha fragment is placed now and worshiped as Yakshi. Pattanam excavation site is to the left background of this temple. The shattered buddha of Pattanam is an immortal piece of art as well. It tells us a lot about South Indian cultural history, iconography, society and polity during the last few thousand years. 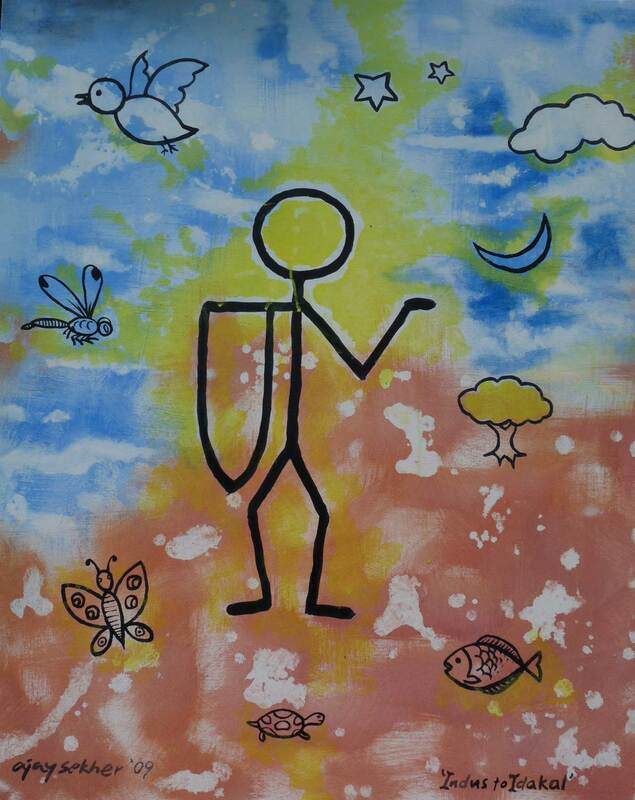 It is an icon of survival, resistance and articulation against invasions and imperialisms, both internal and external. 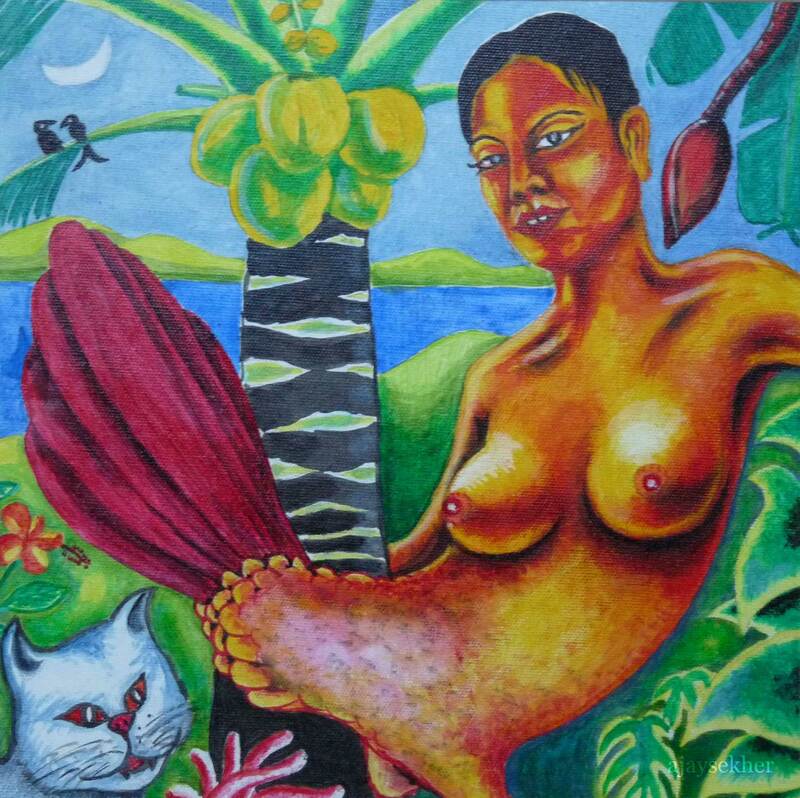 It is an ethical and spiritual work of art that is political and social as well, with its polyphonic significations and liberating visual cultural possibilities. This invaluable treasure and heritage of the whole humanity and Kerala in particular must be preserved and protected by the people and their elected governments for future. 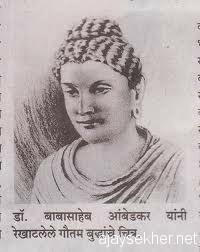 As the neo buddha of India has reminded us the people who do not know history, can not make history. 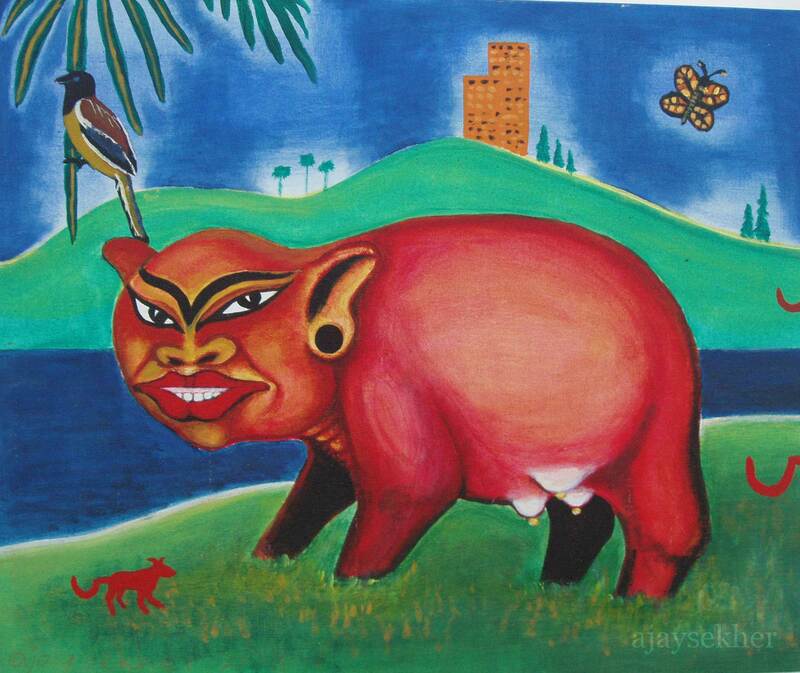 neo buddha of India: Ambedkar merged into the Buddha in the imagination of a dalit artist. Image from the internet. It is vital to remember that the Padmasana a basic posture in Indian Yoga traditions has its origin in the Indus valley Dravidian civilization that dates back to BC 3000. The meditating Yogi in Padmasana amidst wild animals including the tiger and the elephant, recovered from terracotta seals in the Harrappan sites is identified as one of the earliest artistic expressions of this unique nonviolent culture, ethical aesthetics and cosmological vision. The orientalist scholars and early Hindutva ideologues instantly declared it Siva as Pasupati or lord of the beasts. But radical organic intellectuals from the people recovered this iconic image as the early manifestation of Indus valley Dravidian culture and ethics. The rudimentary forms of Sramana/Amana/Chamana ascetic-ethical tradition could be aptly traced back to this Yogi in Padmasana. 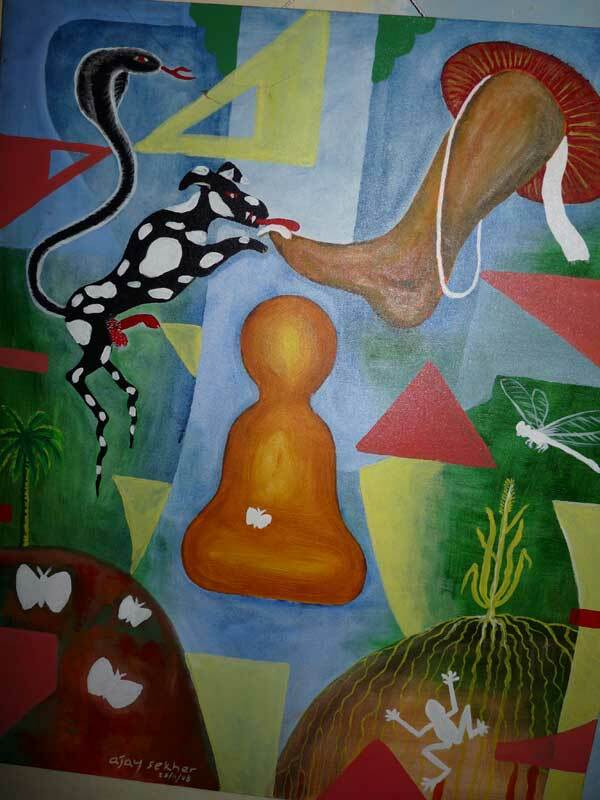 The Jain and Buddhist wisdom and philosophy of nonviolence, renunciation and being one with nature could be appropriately identified with the spiritual tranquility and ethical stability of this human figure amidst animals and the wild forces of nature. It is again vitally important to remember that O V Vijayan the legend of Malayalam letters was struggling to write his last novel titled Padmasanam as death separated him from us. He was trying to connect the Indus valley Yogi in Padmasana with the numerous Sramana idols in south India in the same lotus posture, while negotiating with the Parkinson’s disease. The Pattanam Buddha fragment is there fore the latest addition to this ethical and egalitarian cultural legacy of India that is ever growing and being rediscovered everyday by the people in their various walks of life, struggle and survival. Preserving it for the world and for the posterity with correct details is going to be a task ahead for the people. This entry was posted in Cultural Politics and tagged a broken padmasana, Buddhism in Kerala, Buddhist iconography in Kerala, Buddhist vestiges in Kerala, Karumady buddha, Katanam and Kayamkulam Buddha, KCHR excavations, Kerala and Buddhism, Mavelikara Buddha, neo buddhism in Kerala and Sahodaran, New Buddha from Kerala, New Buddha idol recovered in Ernakulam district of Kerala, new insight into the Buddhist past of Kerala, O V Vijayan's Padmasanam the last projected novel, P J Cherian and Pattanam BUddha, Pattanam archeological site, Pattanam Buddha figure, Pattanam excavation, Pattanam/ Muziris project, Sahodaran Ayyappan, Sahodaran on buddhism, Sahodaranism on November 2, 2012 by Ajay.